News - ©2019 Brooks Forgings Ltd.
As part of our continued expansion, at our Stourbridge manufacturing site, we have acquired a Banning GOA 1250 Drop Hammer. This was one of several forging machines obtained from the purchase of Parker Hannifin's forging facility in Halesowen. Extensive ground works were required to install the Drop Hammer. A full ground survey was undertaken to ascertain the soil & layer composition. This was to ensure the chosen location would be suitable to take the foundations and daily stresses and loads from use of the machine. The completed installation pit measures 4300MM X 3700MM X 2100MM Deep. Noise and vibration levels are reduced by 4 shock absorber seating pads below the machine. The hammer is positioned to take full advantage of a Radyne 450KVA induction heater combined with a fully automated hopper feed. This supplies the hammer operator with a constant and controlled supply of billets at optimal forging temperature. The overall process increases production and reduces costs. 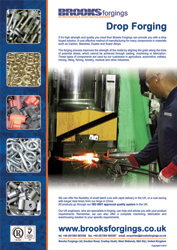 Please contact us today to discuss your Drop Forging requirements. 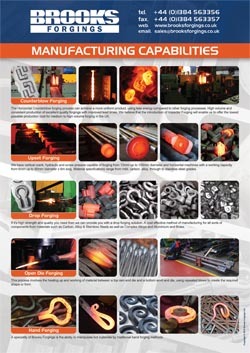 A brief overiew of the Drop Forging process, our capacity and suited products. A brief overview of our Manufacturing Capabilities at Brooks Forgings Ltd.
All content and imagery found on this site is subject to Copyright © Brooks Forgings Limited 2019 and may not be reproduced or distributed without their express permission.